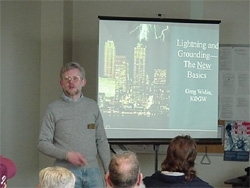 Explaining the principles of radio science (Amateur Radio licensing covers more than just radio science) in the context of an Amateur Radio licensing class takes hard work and dedication. That’s why we support ARRL–registered volunteer instructors.and classroom teachers. The results are extremely gratifying, especially when newcomers earn their own licenses and begin enjoying their new privileges on the air. Register with ARRL as a License Instructor and take advantage of the Instructor/Teacher Discount Program on purchases of designated instructional materials. We’ll add you to our electronic mailing list to keep you up to date on resources and programs you may find valuable to your instruction and classroom activities. We also provide instructional materials online: License Class Resources For Instructors. Before you register, please review ARRL Registered Instructor Qualifications. Please note: You must be a current ARRL Member to be registered as an ARRL Instructor. Instructor registrations must be approved by the ARRL Education Services Dept. before being added to our database. If you do not receive an email confirmation within 5 business days after you submit your registration, please contact us at ead@arrl.org. ARRL Instructors must be acitve ARRL members. Please provide your ARRL Member Number. If so, what club or organization? Any other professional qualifications that you would like us to know about?